When you like wearing mens fashion suits and shirt and pants sets, you know that you just can't wear any old shoes on your feet. Stacy Adams shoes should always be the go to brand name of dress shoes that comes to mind for you. 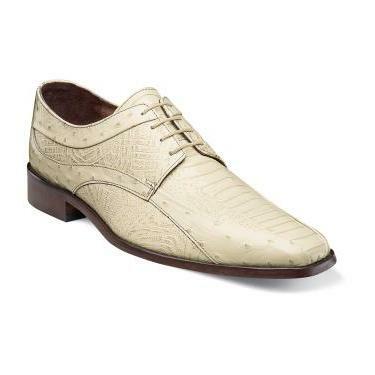 The Fiorenza by Stacy Adams is a cream or ivory color dress shoe with a bike toe style lace up that is made of Ivory color leather in an ostrich print that is sure to please. Wow the crowd every time you're in Public with Stacy Adams Shoes on your feet.